According to the Chinese calendar, 2016 was the Year of the Monkey. The Year of the Rooster started 28th January 2017. You can already now look forward to beautiful issues with the Year of the Rooster. 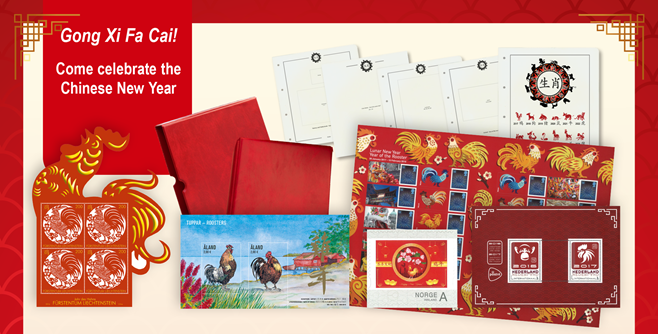 We will deliver you stamp issues celebrating the Year of the Rooster along with special album pages. The average price for each delivery will be approx. € 40.00 - € 50.00, and we will send you a delivery approximately every second month. In the first delivery you will receive: Liechtenstein – Souvenir sheet with the Year of the Rooster with paper cuttings, Åland – Souvenir sheet with Year of the Rooster with drawings made by the world famous engraver Mr. Martin Mörck, Norway – Year of the Rooster, Netherlands – Souvenir sheets with Year of the Rooster and Year of the Monkey, Great-Britain – Year of the Rooster generic sheet and 4 special album pages and a cover page in the well-known Lighthouse quality, with transparent mounts for a perfect presentation of your collection. The regular price of the first delivery is € 59.00. You will receive the delivery with an invoice along with payment information. Free gift: The first 100 customers to order the collection will receive an extra welcome gift: a stamp set and a souvenir sheets issued by Taiwan Post on the occasion of the Year of the Monkey + 1 album page. Approximately every second month, you will receive a new delivery with Year of the Rooster. In the 3rd delivery you will receive a red album with slipcase to make a perfect presentation of your collection. Your price for the album with slipcase is only € 15.00, the regular price is € 37.00. Please note: You are free to cancel your subscription at any time.